"My mission in THIS life is to raise my vibration and that of the planet!" About Me I am a quilter for Quilts of Valor Foundation. Wild Fact About Me When I was little I kept picking up dead bees and being surprised every time when I was stung. I am a black belt in Kung Fu San Soo. My Philosophy I am that I am. What Gives Me Hope Seeing sunrises and sunsets. If I were Mayor, I'd make the world a better place by Create labyrinths in our city park and schools!! What/who changed my life and why Finding the KRYON books and YOUTUBE postings. I have always felt different and did not know why I believed outside of the accepted norms. Quotation Only a white man can cut the top off a blanket and sew it to the bottom and expect it to be longer. American Indian saying about daylight savings time (used in CA, USA). Enjoy today, it is your gift from yesterday! Hello Sandy! This is a Gif I created from an old black and white drawing that I made long ago : Pure Love. I wish you a Nice Day! May YOU enjoy your special day - and all your wishes come true (love, good health, abundance) HAPPY BIRTHDAY, Keep On Rockin"
I'm very happy to be one of your friends. 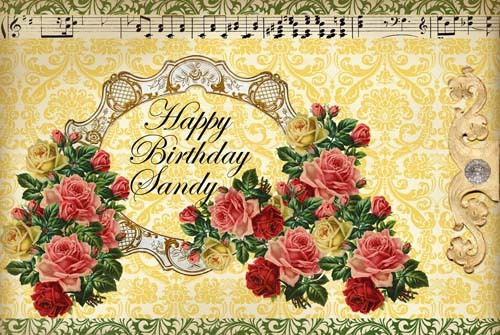 Thanks for being a Care2 friend Sandy!